Max Holloway had a Babe Ruth moment of sorts. 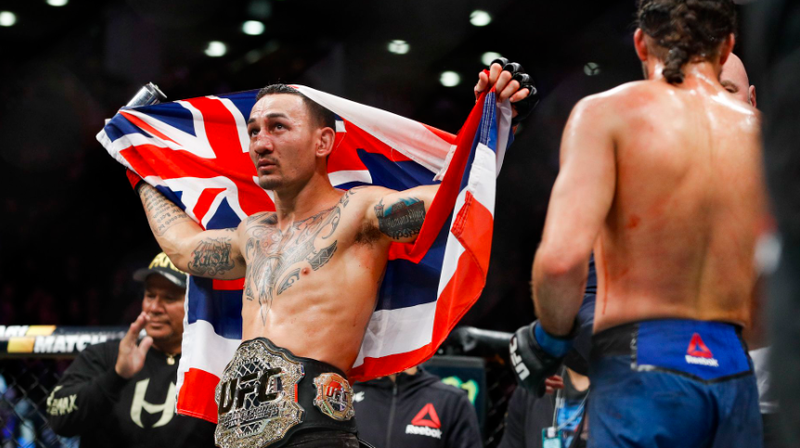 Holloway successfully retained the UFC Featherweight Championship by defeating Brian Ortega, who didn’t answer the horn after the fourth round. Holloway started the fight strong, winning the striking game on the feet, though Ortega had his fair share in. Ortega managed to score a takedown but Holloway got back to his feet quickly before Ortega could do much damage. Holloway then dominated the second round, busting up Ortega with a barrage of blows. Ortega tried to spark a comeback in the third, rocking the defending champion with multiple strikes and forcing Holloway onto his back foot. Between the third and fourth, Holloway told the commentary team he planned to finish the fight in the fourth round. That round, Holloway and Ortega both threw heavy leather, but Holloway was the one who nearly got the stoppage several times throughout the five minutes. While he did not get the finish directly, the doctors stopped the fight at the end of the round, feeling Ortega took too much damage to continue into the fifth. In the co-main event, Valentina Shevchenko took home the vacant UFC Women’s Flyweight Title with a decision win over Joanna Jedrzejczyk. Shevchenko dominated the first round with grappling, taking Jedrzejczyk down quickly and landing some ground-and-pound and holding her up against the cage. Jedrzejczyk slowly started to find her groove, taking that into the second round, but Shevchenko had her own highlights in the second, mainly a slam on the former strawweight champion. After a more even third round, Jedrzejczyk came out with a sense of urgency in the fourth. And while she brought out a flurry, Shevchenko’s grappling was too much to handle yet again. Shevchenko clinched with Jedrzejczyk for a majority of the fifth, easing her way to a win. All three judges gave the bout to Shevchenko 49-46.